Arnaud Desjardins is one of the few Europeans who carry in their teachings the Vedanta, (the essence of the Vedas), based not only on his excellent knowledge but also on his personal experience. A student of Swami Prajnanpad, he was a filmmaker working for French TV, a member of the most important Eastern spiritual and religious communities and an infatigable traveller. He gave many years of his life living near great teachers and monks, writing down and filming, and many of his works are considered precious documents, such as his film on the communities of Sufi sages in Afghanistan. With his camera, he committed on record the life and work of grat Indian sages and yogis, he stayed in Japan and Tibet and made landmark films on Tibetan Buddhism. Arnaud Desjardins today lives in his Ashram in Ηauteville, in the south of France. After many - maybe more than 20 - years of teaching, he now entrusts the greater part of the teaching to his best students. He is a really remarkable man, of luminous clarity, knowledge and culture, who leads his students one step at a time, through their individual problems, combining psychology with the deepest, ultimate wisdom. 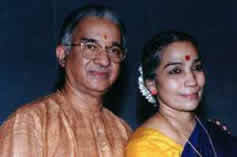 The famous dancing couple met at the Kalakshetra Dance Academy in Chennai (then Madras), in the south of India. V.P. Dhananjayan was born in 1939 in a Kerala village, the son of a teacher. Chandu Panicker, who then was a dance teacher in Kalakshetra, toured the provinces looking for young students, and chose the 14-year old boy to come with him and become a dancer. He spent in Kalakshetra the next 15 years of his life studying dance but also as leading dancer in the performances from 1955 to '67. There, he met his future wife, Shanta, daughter of a wealthy family with Kerala roots and a wonder-child in dance, who was studying there since the age of 8. The two young people had often the chance to dance together in the school performances, and later succeeded in convincing their parents to consent to their marriage. From the late '60s they left Kalakshetra and started creating their own performances, creating a stir with the new ideas and the new repertoire which they developed. The dynamism of their dance, the costumes, the combination of the male and female elements in specially choreographed duets made them something unique and led them to assignments abroad, in the greatest artistic centres of the world. They have formed their own dance and music academy, called Bharata Kalanjali, in Chennai, as well as the Bhaaskara in Kerala. V.P. Dhananjayan, holder of a Political Science degree and author of books on dance, is an activie militant for the recognition and encouragement of men dancers in India. Adyar K. Lakshman was born in 1933 in Andhra Pradesh, India, where his father was a schoolteacher. Shri. P.D. Doraiswamy Iyer, a representative of Rukmini Devi Arundale, founder of the Kalakshetra dance school, was impressed with his musical and rhythmical talent, as well as that of his brother, Rama Rao, and offered the two boys a scholarship to go and study in Kalakshetra. There, in 1944, at the age of 11, Adyar K. Lakshman started his musical and dancing education (Bharata Natyam, mridangam drum but also . Nattuvangam, meaning dance direction) with the best teachers, including Rukmini Devi herself as well as some of the most famous devadasis of theri time, such as Mylapore Gowri Ammal. He also studied the Kathakali dance style, with Ambu Panicker and Chandu Panicker. After the end of his formal studies in 1948 he started participating in the Kalakshetra performances and went on to postgraduate studies, in dance, drums and dance direction. In 1958 he started broadcasting his singing recitals on the radio, something he went on doing until a few years ago, and was part of the French record titled Inde Thala. His teaching career naturally started in Kalakshetra, where he tought dance, music, dance direction, mridangam and the Sanscrit language. From 1956 since 1969 he was the main dance teacher in Natyalaya. He was one of the first Bharata Natyam teachers to travel abroad - in the '60s, teaching a great number of students, earning the affectionate nickname "the international guru". In 1969 he created his own school, the Bharata Choodamani Academy for Fine Arts in south Madras (today's Chennai). More than 100 students have until today given their arangetram in India and also abroad. Shri. Adyar Lakshman is one of the most famous nattuvanars in India and his dance direction is defined by the dynamic rhythm he gives to the dancers. He has travelled all over India, Sri Lanka and Pakistan, as well as in the main cities of the U.S.A., most of the countries of Western and Eastern Europe, former U.S.S.R., in Australia, Japan etc... He was singer and dance director in the Kalakshetra dance-dramas but also in the recitals of famous dancers such as Rukmini Devi, the Dhananjayans, the legendary dancer Kamala and many more. He has choreographed many pieces, distinguished by their rhythmical intensity and the delicacy in the psychology of the characters. He has been honoured with numerous awards, among which the Kalai Mamani (1981), Padmashri (1989) and Sangeet Natak Academy (1991). The family tradition is followed by his daughter, υ Induvadana Balan Malli, dancer, musician and teacher, as well as his twin sons Baba Prasad and Krishna Prasad (dance direction - percussion). The daughter of a high-caste family, she started dance in the '30s, at the age of 7, under the tutelage of the famed devadasi Gauri Amal and of nattuvanar Kannapeta Pillai, as well as of Chinnaja Naidu, who was one of the greatest teachers of abhinaya, the art of expression. She started her public appearances with great success; however, at the age of 16, social norms obliged her to get married and put a stop to her dancing to devote herself to her role of wife and mother. The years went by, and the dance which had been banned from the temples, started getting recognition and finding a new life as a stage art. The essence of the art, however, that is the refined expression of the character's emotions through abhinaya, was lost with the devadasis, and what was left was the dancing technique and prowness. 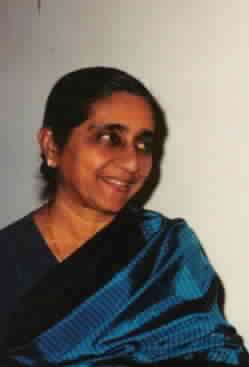 It was thus that, under pressure from the authorities, at the beginning of the '70s, after a hiatus of 30 years, Kalanidhi Narayanan came again into the limelight, in order to help the survival of tradition, as she was the only remaining teacher of the old art of expression and the language of feelings. At the beginning, there were some adverse reactions from the side of the teachers, afraid that what was to be revived would humble their art and make it more vulgar. To the point that some of them forbade their students to go and take lessons from Kalanidhi, threatening to refuse teaching them any further if they disobeyed. The '80s, however, were very different than the '30s: Kalanidhi's art elicited an enthusiastic response and found widespread recognition. Thanks to this charismatic teacher, a very precious part of dance was salvaged, a part without which the dance would be dry and academic. She has been awarded many honours, and the then Prime Minister Rajiv Gandhi gave her a gold medal for her services to the country. She has been recognised as Padma Bhushan, the second best honour in India. Her students bear the mark of her teaching and honour her with their successes in India and abroad. Son of the legendary teacher Sri T. Krishnamacharya (who taught, among many others, B.K.S. 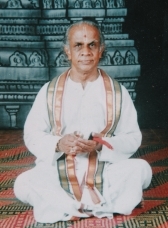 Iyengar and Patabhi Jois), grew up with yoga, but his first choice of study was engineering. 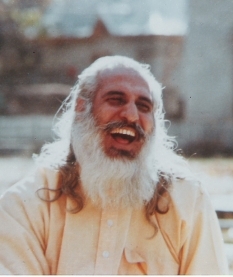 Those studies, as he now says, helped him a lot in the work to which he finally devoted himself, maybe by developing the admirable talent of expressing himself with simplicity and clarity, something witnessed by the hundreds of students visiting his yoga centre, and seen in his equally admirable books such as The Heart of Yoga. From his father's teaching, he "inherited" the idea that yoga is not a corset to which everybody must squeeze into, but on the contrary, that its wonderful variety and flexibility allow for countless variations and adaptations to the needs of each human being. Another central tenet of his teaching is the primacy of the breath during the asanas, as well as the succession of asanas which flow one into another. A simple, unassuming and calm person, as far as is possible from every hint of conceitedness, he lives and teaches far from the limelight, and although he often travels abroad, he never sought to create "branches" or become a guru superstar in the West, preferring instead to welcome students from every corner of the globe in the simple space his father founded in Chennai, and which he continues managing with the same devotion. Chandra Swami is one of the most important contemporary figures of liberated Indian sages, who incarnates in his day to day life the essence of the ancient philosophical texts, keeping himself on top of spiritual integrity. He was born on March 56h, 1930, in Pakistan, in the village of the great sage Baba Bhuman Shah (1687-1747), who was his spiritual guide. At the age of 22, following his internal voice, he left his post-graduate studies, his possessions, his family and friends and left in order to follow the difficult and adventurous life of the ascete. He lived for eight years in a cave in Jammu and Kashmir and from 1961 to 1970 he lived all alone in the jungle, on a desert island on the river Ganga, near wild beasts and in dangerous circumstances, floods and heat waves. It was there that he had the supreme spiritual experience, which hasn't left him since then. Today he lives at the ashram Sadhana Kendra, in the midst of peaceful mountains, near the river Yamuna. Swamiji remains in absolute silence for the past 20 years. His silence, however, is more melodious and more important than thousands of words. A wave of sanctity hovers around him and extends to every guest who immediately feels his charm, his depth and his love. Life near Chandra Swami is a special and unique life experience for the visitor, a place of internal change and illumination.